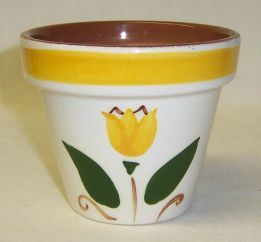 This is a really nice 3 1/8 inch high Yellow Tulip Flower Pot made by Stangl. The Flower Pot measures 3 5/8 inches in diameter at the top and is signed STANGL Trenton, N.J. It is in really good condition with no chips or cracks. The painted decoration is very good. We guarantee all items to be as described. THANK YOU. This is a really nice Thistle Gravy or Sauce Boat made by Stangl Pottery. This Gravy measures 8 3/4 inches long X 3 3/4 inches wide. It is signed on the bottom STANGL POTTERY TRENTON NJ THISTLE. It is in very good condition with no chips or cracks. We guarantee items to be as described. THANK YOU. This is a really great Thistle 8 Inch Round Vegetable or Serving Bowl made by Stangl Pottery. This Bowl measures 2 1/2 inches high. It is signed on the bottom STANGL POTTERY TRENTON NJ THISTLE. The Bowl is in very good condition with no chips or cracks. We guarantee items to be as described. THANK YOU. This is a really great Thistle Individual One Cup Coffee Pot with Lid made by Stangl Pottery. This Coffee Pot measures 5 3/4 inches high to top of lid. It is artist signed on the bottom. Both the bottom and lid are in very good condition with no chips or cracks. We guarantee items to be as described. THANK YOU.